With Duluth, Madison, and Fargo-Moorhead easily road-trippable from the Twin Cities metro, it’s understandable that Sioux Falls, South Dakota, gets overlooked. This surprisingly big little city is part of a metro area of around 260,000 people and it’s just a donut’s throw from southwestern Minnesota. 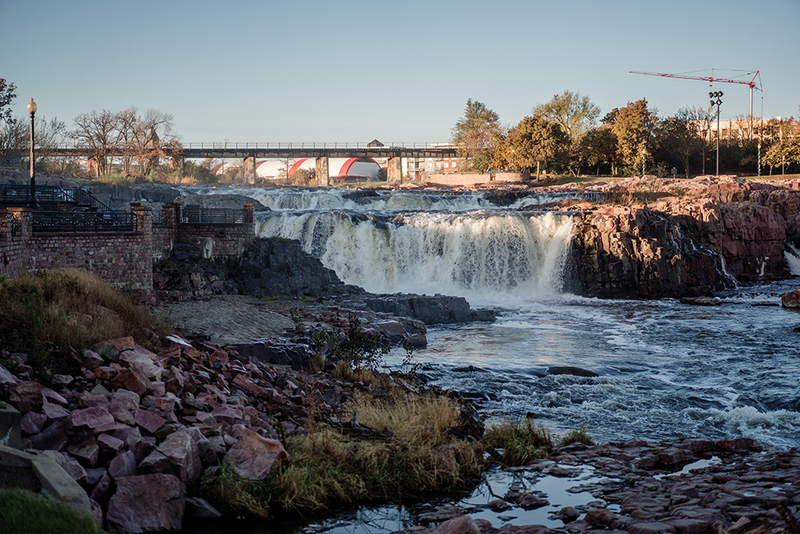 Sioux Falls was founded contemporaneously with Minneapolis and St. Paul, and you can see echoes of the cities’ founding eras in the red-hued buildings that populate their downtowns (largely pink granite here, Sioux Quartzite there). And like Minneapolis, Sioux Falls has a gorgeous, coursing waterway at its heart. The cascades of the Big Sioux River are easily as lovely as the St. Anthony Falls, but they further benefit from a cleverly built park that lets visitors stand on a dais surrounded by a spectacle of surging water, with a nearly 360-degree view of the area. The city itself breaks into three distinct experiences. There’s a suburban zone of modern-looking strip malls and cookie-cutter McMansions. There’s an interior urban zone that is a bewildering mix of sports medicine and chiropractic practices, delightfully scuzzy pocket-sized mini-casinos, and otherwise respectable eateries and businesses. And then there’s the roughly 5-block-by-5-block downtown area, which is as manicured and thoughtful as anything you might find in Minneapolis or Madison but with a higher proportion of locally owned independent businesses. A carefully curated sculpture walk consisting of a mix of charming kitsch and legitimately beautiful pieces makes exploring the downtown zone a real pleasure. But you’re probably not here for urban planning notes; on to the (generally excellent) food. On our way down to Sioux Falls via 169, we stopped for lunch in Mankato at Massad’s Mediterranean Grille. The restaurant’s Chicken Schwarma in a pita ($5.79 for a 7-inch sandwich) had a nice tangy kick of lemon and fully flavored, tender pieces of marinated chicken. An accompanying soup was corn and peas–forward, creamy, and curry-focused in a comforting way. Our Massad Salad ($7) was dominated by the same marinated chicken highlighted with a citrus dressing and a rich mix of peppers, lettuce, and tomatoes. The first place we ate in Sioux Falls was Jacky’s, a small local franchise nominally focused on Guatemalan food. In practice, most of the menu was a copy-paste of a typical Tex-Mex joint, with fajitas, burritos, and taquitos dominating the list. That said, there were some outliers. 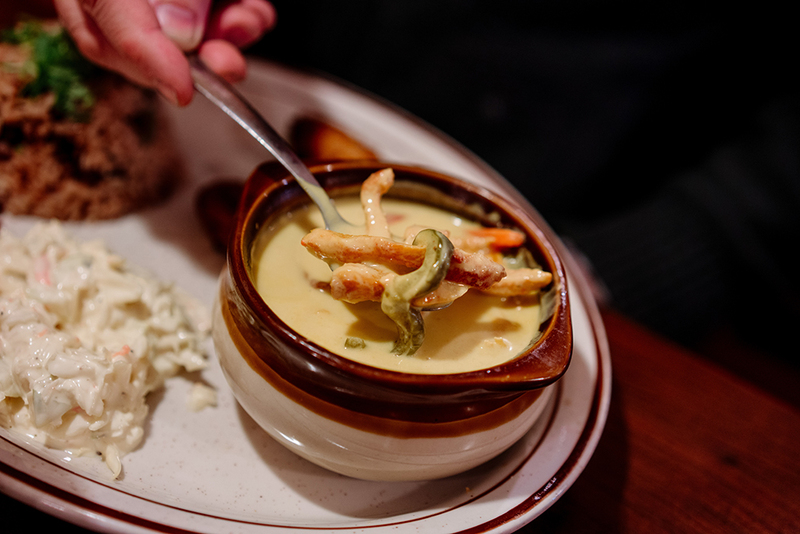 We ordered the charmingly named Authentic Guatemalan Dish ($14) and found it to be surprisingly evocative of a Thai curry, with thin strips of sauteed chicken swimming in a bath of spiced coconut milk, waiting to be spooned atop a mix of nicely prepared beans and rice. The addition of a few perfectly cooked pieces of plantain elevated this dish yet another notch. 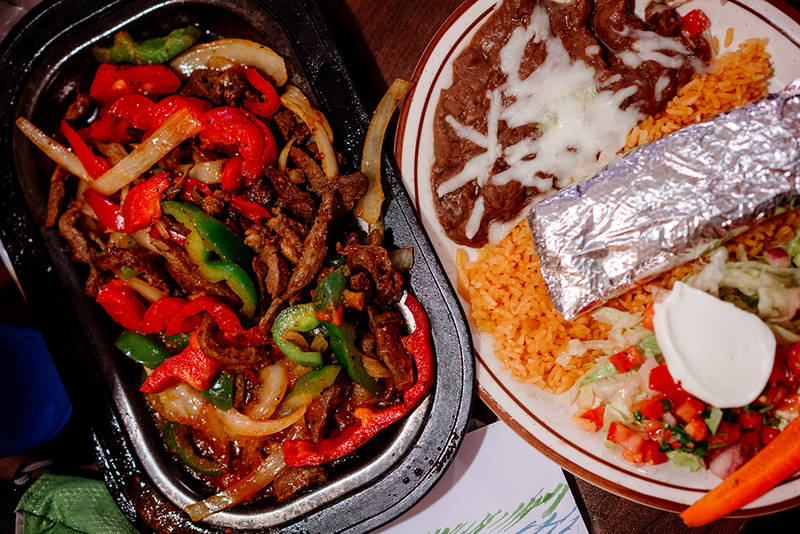 Our Steak Fajitas ($15) were pretty much right on target, serving up a large portion of meat and sauteed onions and bell peppers plus the usual rice, beans, pico de gallo, guac, sour cream, and tortillas. The beef was tender and well seasoned, and the beans exceptionally good, with a strikingly creamy texture and rich flavor. The less said about our Lime Margarita ($6), the better—if Mountain Dew was a margarita, this is what you’d get. To be fair, this is one of those things where market demand, rather than the restaurant itself, is probably at fault. When you name your first kid Josiah (as I did), it’s hard not to be in the tank for a place called Josiah’s Coffeehouse and Cafe. Still, the place was charming and skillful even once you filter my personal bias out of the picture. 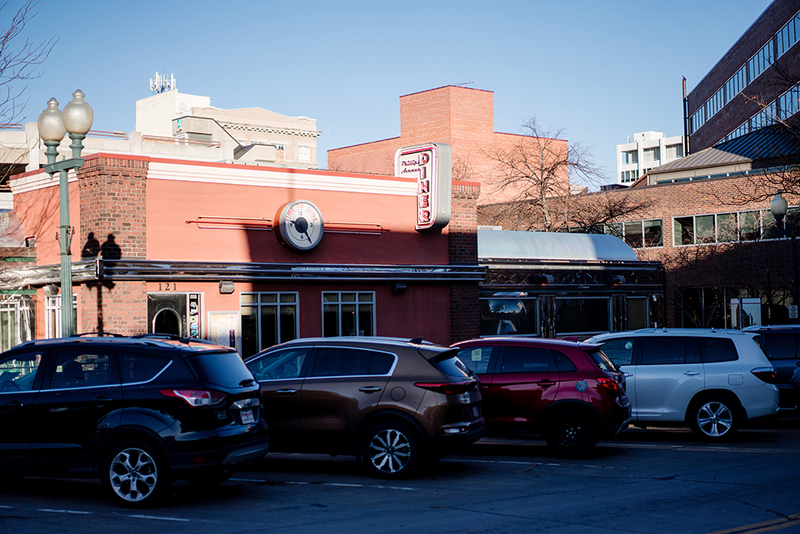 With a clean-cut, roomy modern atmosphere evocative of Bad Waitress or Spyhouse, Josiah’s invites you to stretch out and enjoy a variety of breakfast-y (or lunch-y) options. We started with a Blueberry Danish ($4) and were delighted to find it packed with a pile of wild blueberry compote (as opposed to a sugary jam), and composed of a buttery crust with enough salt to balance the sugar of the icing and filling. The Eggs Benedict ($11.50) featured a Hollandaise that leaned hard toward paprika and herbs (as opposed to lemon) but the twist worked—it gave the dish an almost “deviled” flavor profile that complemented the strips of ham and poached eggs quite nicely. And our Avocado Toast ($9) featured a good salt versus avocado balance, and was toasted enough without being burnt. While at Josiah’s, we picked up a loaf of Raisin Bread ($5) made by Breadico di Napolitano. Most cinnamon and raisin breads like this tend to be brioche (to further lean into and amplify the overall sweetness of the dish), but this one had more of a whole wheat thing going on, which made for a pleasant contrast of sweet and savory. Speaking of breakfast, we made a detour out of downtown to check out Flyboy Donuts, and boy are we glad that we did. 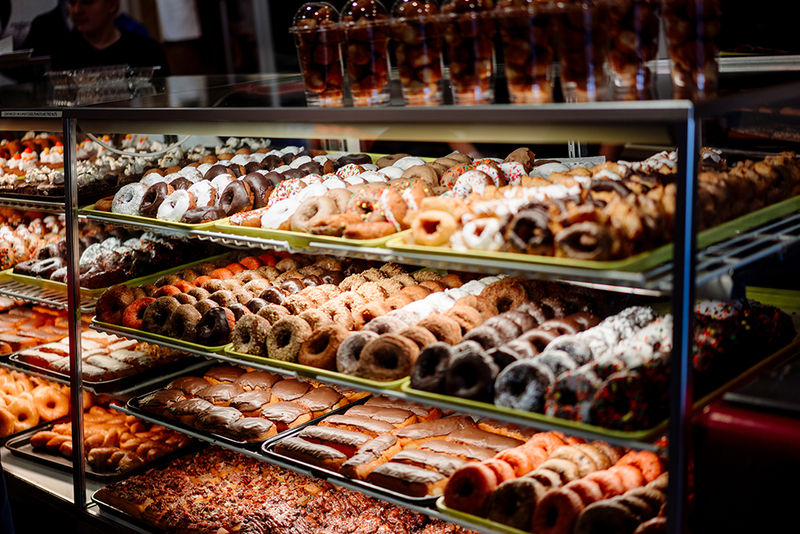 The shop’s website really sells the shop’s silly / decorative donuts, but it turns out that the majority of their stock on hand is old-school classics, beautifully executed for $1‒2 each. We found the flavors in our maple-glazed and chocolate-glazed donuts to be spot on—sweet but not overly so, with strong, pleasant natural flavors infusing the icing. Our blueberry cake donut was also excellent—tender with bits of bold, wild-tasting blueberries. Nothing goes with donuts like coffee, and our trip to Coffea Roasterie in downtown Sioux Falls was a rewarding one. When sampling a new coffee shop, we like to try a mocha to get a sense of the place’s values—will the drink be a sugary mess? Will the chocolate element taste like cacao or like Hershey’s syrup? Will the flavor of coffee express itself or be squashed? Caffea’s Mocha ($4.90 for 12 ounces) was elegant and restrained, with darkly roasted coffee leading the way and natural-tasting cocoa following in its wake, noticeable but tasteful. 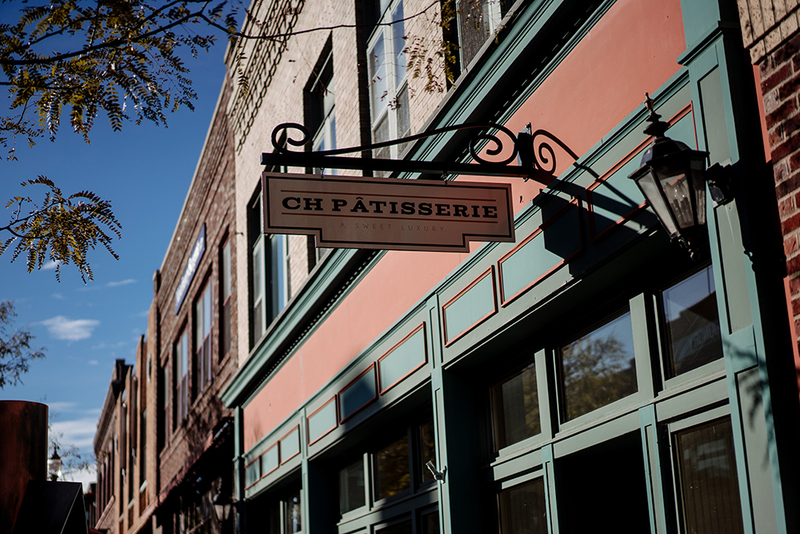 A lot of noise has been made about CH Patisserie, a French-inspired bakery in the heart of downtown Sioux Falls run by Chris Hanmer, a former Ritz Carlton executive pastry chef and “Top Chef: Just Desserts” champion. The noise about this exquisite-to-the-point-of-slightly-intimidating little shop is fully justified. 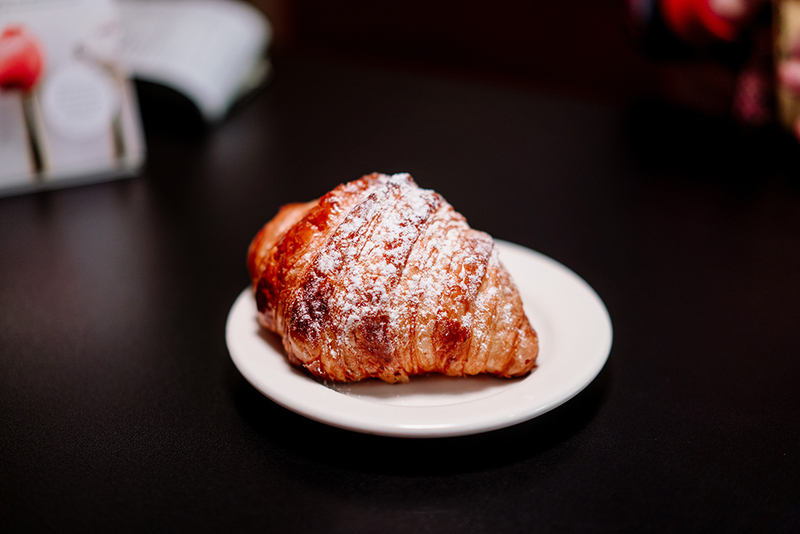 We tried the shop’s croissants ($4) and found them to be every bit the equal of Minnesota spots like Bellecour and Patisserie 46—when we bit into our croissant, it exploded in a shiver of buttery flakes, one of the signs that you’re getting the real, fully laminated deal. 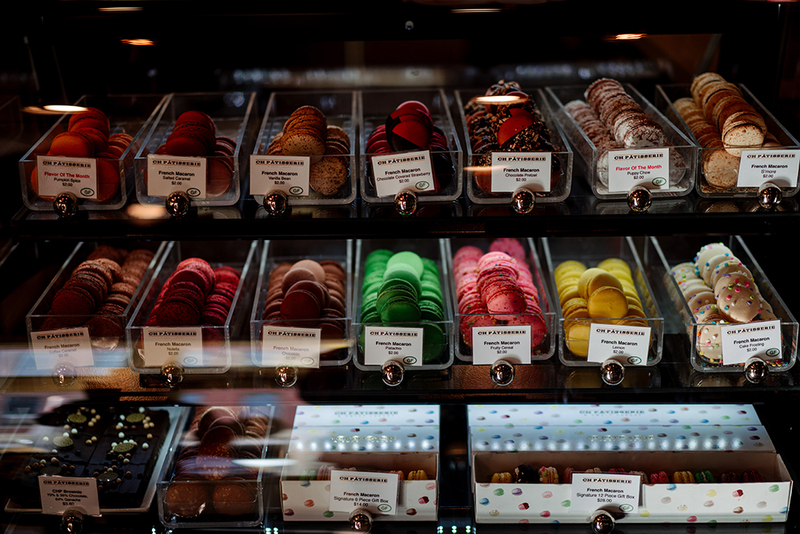 We mowed down about a half-dozen of the bakery’s French macarons ($2 each) and were astounded at their perfection: shape, size, color, texture, depth of flavor, balance between exterior and filling—they couldn’t be improved upon. Everything from the Vanilla Bean to the Coffee Caramel to the Chocolate Strawberry was executed with real skill. If you don’t hit CH Patisserie while you’re in town, you blew it. Bagel Boy seemed like a dicey prospect: a Sioux Falls bagel shop located right in the heart of pocket-casino central, about 20 blocks south of downtown on Minnesota Avenue. And yet: the place was packed with customers on a Saturday morning, lining up 10 deep to order remarkably cheap and uniformly good bagel sandwiches. 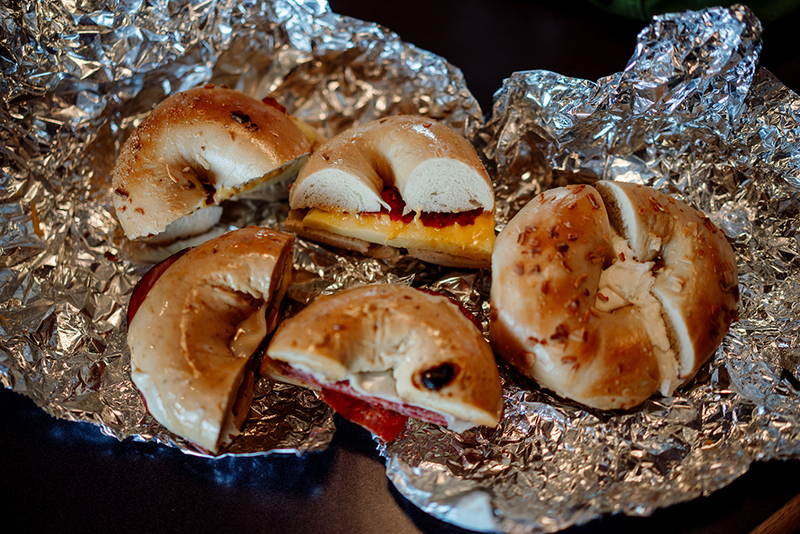 The bagels themselves were workaday in the best possible way: properly chewy and dense, ideal platforms for savory toppings like the salami and pepperoni that topped our Italian sandwich ($5.75) or the egg and cheese and bacon that came on our Bacon Breakfast Boy ($3.50). When you go, make a note of the shop’s art, which includes hand-painted recreations of classics like “The Creation of Adam,” featuring more Bagel Boy–featured details than the original works. Our Farmer’s Scramble ($10.50) was more potato driven than egg-focused, but it worked—a heavy blast of lemony Hollandaise covered this orchestra of savory notes including bacon, spinach, and tomatoes. Big Red BBQ has a reputation as being one of the finest spots for Q in South Dakota, so we were bummed out when we went for lunch on a Saturday and found it closed with a note on the door about switching to winter hours. We ended up at Backyard Grill instead, a spot that lived up to the modest expectations it sets with its downtown location and polished, modern interior. 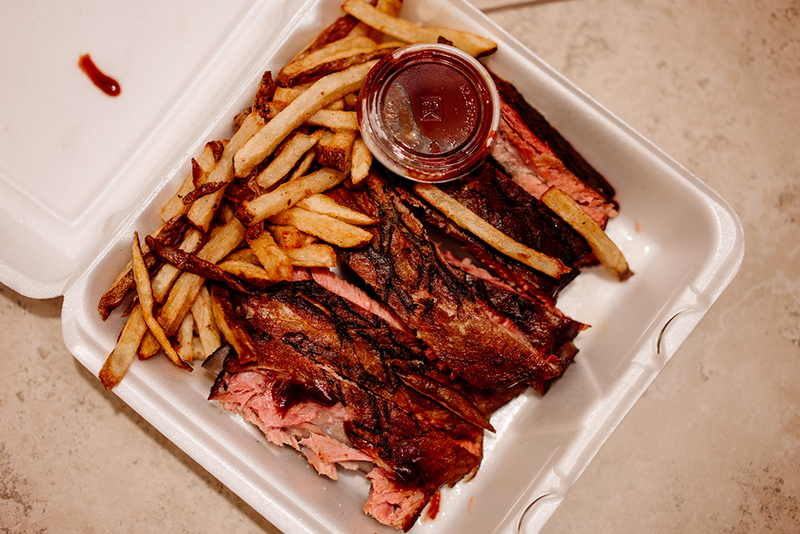 Our half rack of St. Louis–cut ribs ($13.75) was too tender and lacked much in terms of flavor or texture. The Beef Brisket Sandwich ($8.75) was milder still, resembling chunks from a British Isles beef stew on a bun. The addition of house BBQ sauce (well balanced, nice heat, a bit too much liquid smoke) helped, but no amount of sauce can replace the texture and deep flavor of a long session with a wood fire. And our side of Molasses Baked Beans was sweet as a candy bar but pleasantly al dente in texture. Backyard Grill; Three locations, we dined at 323 S. Phillips Ave., Sioux Falls, 605-271-2672. Prices vary by location. Sioux Falls has a healthy craft brewing scene, with spots including WoodGrain Brewing Co., Remedy Brewing Co., and Hydra Beer Company. We only managed one beer during our food-focused trip, a Lion’s Paw Lager by Fernson Brewing Company, but we were impressed—it was clean, crisp, and refreshing without lacking character; had a pleasantly creamy texture; and expressed its malty side with clarity and restraint. Fernson has two taprooms; we tried Lion’s Paw on draft at Backyard Grill. When we did our research for our Sioux Falls expedition, we were startled to discover an authentic Afghan restaurant located on the west side of town. Khorasan Kabob House touts “The finest in Afghan Carpets and Cuisine,” and while we can’t speak to the quality of the restaurant’s many floor coverings, we can say that the food compared (in most cases favorably) to Afghan restaurants we’ve frequented in New York, Boston, and Chicago. The restaurant’s Stuffed Grape Leaves ($6) tasted fresh off the vine. 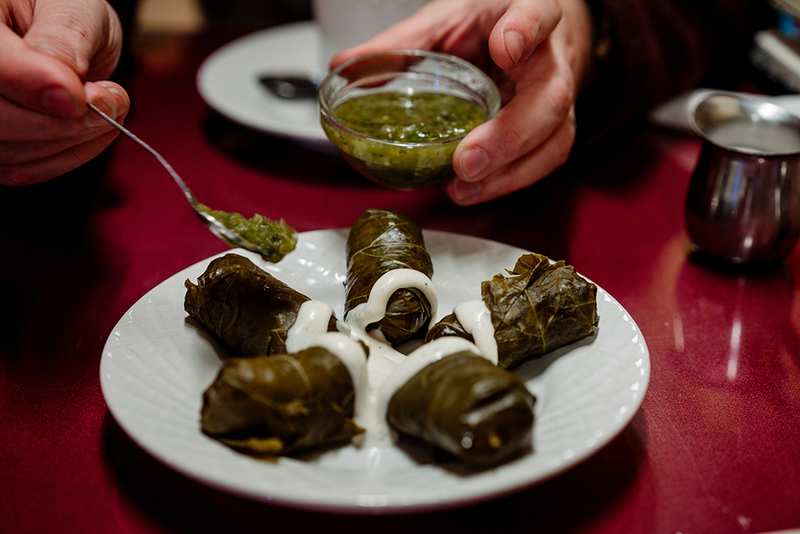 Dolmades can taste gluey or painfully acid-forward, but these were tender, mellow, and gorgeously seasoned, accompanied by a thick, flavorful yogurt sauce and a punchy, herbal green sauce. Taken as a whole, this was a dish to remember. We ordered the Paratha ($2), a buttery, layered bread, on a lark. 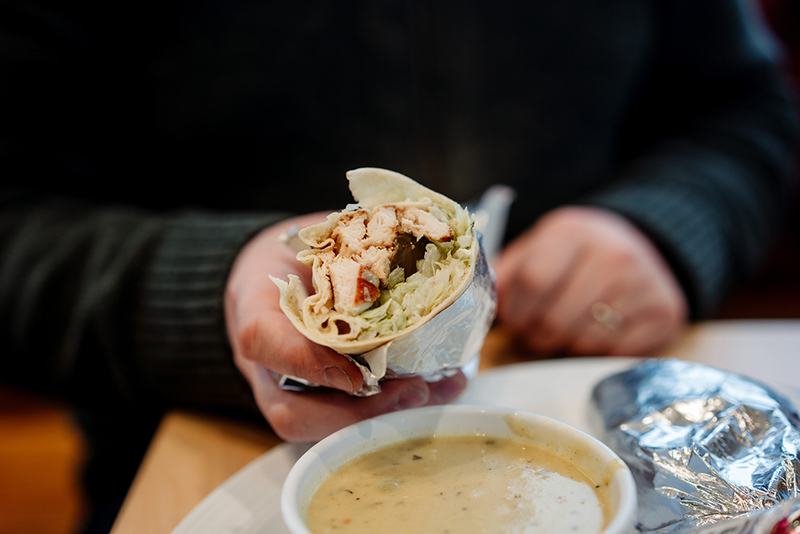 It turned out to be the best paratha we’ve ever tried—incredibly flaky, tender, and buttery, and an ideal vehicle for our order of richly spiced, creamy Butter Chicken ($13.50). 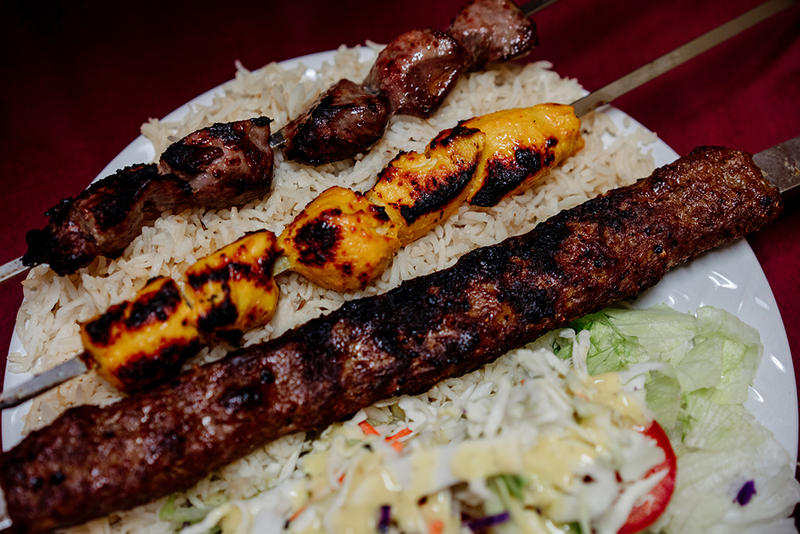 The Sultan Kebab (lamb kofta on a sword and chunks of beef and chicken on skewers, $17) was a savory feast of epic proportions, the properly aggressive charring providing a counterpoint to the tender marinated pieces of meat. And our beverages were equally good: our lava-hot, profoundly spiced Chai Milk Tea ($3) tasted house-made (as opposed to being made from a mix or syrup), offering rich, complex flavor and a proper (which is to say understated) amount of sweetness. 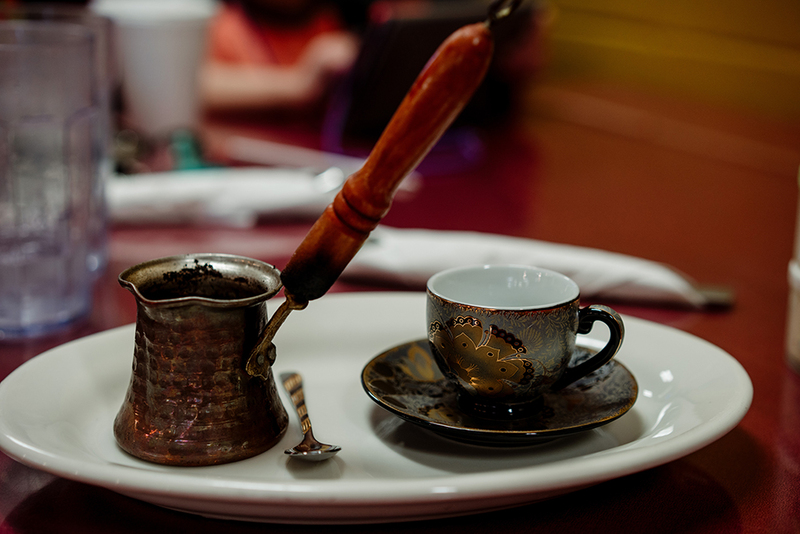 Our Turkish Coffee ($3) could have been a bit thicker, but the flavor and spicing was on point, and the coffee service itself was elegant and dramatic. Also see our other Growler Whirlwind Tours: The Twin Ports of Duluth-Superior, five independent eateries in Woodbury, MN, and Wisconsin’s South Shore of Lake Superior.